The actress, who is in the French city for a professional commitment, is making the most of her time. Aishwarya Rai Bachchan’s latest Instagram post with Aaradhya. 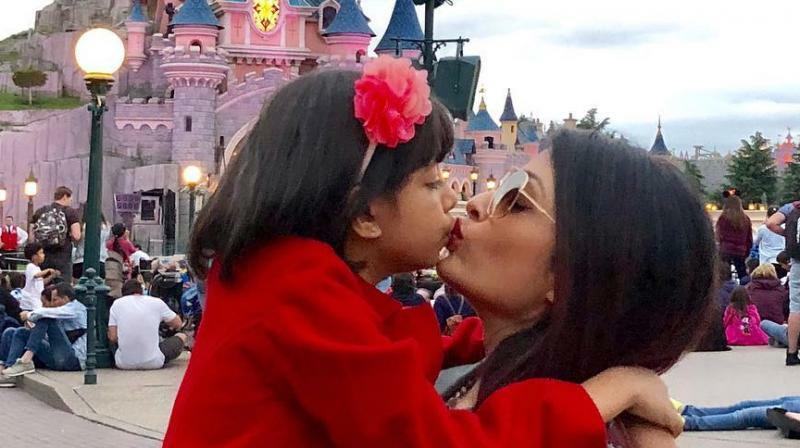 New Delhi: Actress Aishwarya Rai Bachchan took to Instagram to post a picture with her daughter Aradhya Bachchan and called her the 'Eternal Love'. "My Princess Angel's Happiness means the World to me My Aaradhya...My LIFE My Eternal LOVE" she wrote. The actress is seen kissing her daughter on the lips. The last time Ash shared a similar picture, there was uproar from a section of social media, who called it inappropriate and some trolled her. But the latest post proves she doesn’t give two hoots about the trolls. A video of the two at the venue also made its way to social media. The actress will be next seen in Atul Manjrekar's upcoming musical comedy 'Fanney Khan' along with Rajkummar Rao and Anil Kapoor. The movie is slated to hit the theatres on August 3 this year.